Supports Pale Moon [25.0a1pre - 28. *], Firefox [2.0 - 50. *], SeaMonkey [2.0a1 - 2.40], Thunderbird [2.0 - 50. *], and Sunbird [0.3 - 5.0b2pre]. NOTICE: The Browser you're using may not be supported by About Add-ons. If you believe this to be in error, please check your browser's User Agent settings. About Add-ons is free software supported by donations, not advertisements. Welcome to the About Add-ons home page! This simple extension is designed to do only one thing: place an About Button on each extension, theme, and language in your Add-ons Manager. 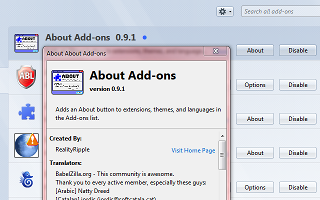 About Add-ons was first released in early 2009 for Firefox, SeaMonkey, and Thunderbird. Sunbird support was also included shortly after, and finally in 2015, Pale Moon support was added. Since About Addon's final release for Firefox and Thunderbird in May of 2016, Mozilla has abandoned its own technologies in favor of poor parody of Google's protocols (WebExtensions), leaving many developers, including this one, disillusioned with the direction the Mozilla is taking. In contrast, Pale Moon has stepped into place as an XUL-centric browser, keeping backward compatibility better than Mozilla's own flagship project. So, for now, About Add-ons may be considered a Pale Moon and SeaMonkey extension that still supports older versions of Firefox and Thunderbird. About Add-ons is free for use or modification without limitation. However, it comes with no license, warranty, or guarantee of any kind. That being said, you can still ask any questions in the Comments section below, or contact me directly for assistance. This extension does not support versions of Firefox after 50.0. How does this differ from the native "More" link that is already there? That depends on the Add-on. The management page you see when you click "More" includes some simple about-information, and may contain settings, donation links, and update settings. The About dialog, which About Add-ons adds a button to access, contains credits such as authors, contributors, translators, and the like, as well as their websites. It can also contain whatever information the Add-on developer chooses to include. Nice to be the first one to comment about this add-on. It only add an about-button next every add-on in your list and that can be convieniant. I can not live with the "New Chrome-Firefox" so I am using the "old" FF 52.6 (or 7)->ESR<- for ever en ever till it dies :-) Intelligent readers do understand this :-)So I am moving to PaleMoon but this wil take many weeks to get al the "nice old customizations" working again. Maybe, the "old Firefox" / PaleMoon e.o. has a few minor disadvantages, hm.. it it 0,2 sec. slower yeahyeah..,sometimes use more memory, eso.. but experienced users needs lot of customizations to obtain many more features.. I hope that developers understand this..